I have a wonderful friend, Marko Gnann, who travels the world and brings or sends back, among other things, some great baking ideas. It was he who introduced me to the Kouign Amann which now graces the cover of my upcoming book The Baking Bible. Marko's latest contribution is this adorable cookie from Barcelona. 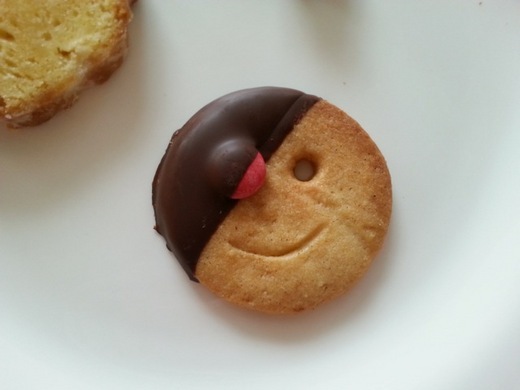 He reports that the cookie consisted of "a very nicely balanced shortbread with the right amount of salt and then the chocolate for a sweeter section." Last I visited the city I was stunned by the creativity taking place in the bakeries throughout the city. Thought you'd all enjoy this photo. ANNA QUESTION: I have all of your books and am a huge fan. Your teaching style appeals to me, as I am a university math instructor. One of my favorite recipes is your Shortbread. It needs no improving, but I sometimes would like a little chocolate or nuts with them. Have you ever tried putting mini chocolate chips in the dough or finely chopped pecans? ROSE REPLY: thank you! I haven't tried putting mini chocolate chips in the dough -- -- as you know, it's a very fragile dough. But I have frosted it with a thin layer of ganache, or tempered chocolate. I haven't tried adding finely chopped pecans but I'm quite sure that would work perfectly. also, the nuts and the chocolate would be terrific together! ARIELLA QUESTIONFeedback: Hi....... maybe you can help me. i have been making cookies and icing - powdered sugar, water and corn syrup - i have to heat the corn syrup a bit to get the icing to harden b/c there is a lot of damp in the air here. but sometimes - only sometimes - when the icing dries - the color dries and becomes kind of white (as opposed to whatever color the frosting is) - why is this and what can i do to correct it? ROSE REPLY i don't understand why you're using corn syrup in the icing. why not use a traditional royal icing with powdered sugar and egg white or meringue powder? i could see adding corn syrup if the air were dry to keep it from crusting as fast but you have the opposite problem of dampness in the air. by the way, for really intense colors for decorating and then baking the cookies try mixing a little food color into egg yolk and painting it on. this is the ancient recipe for tempera painting and works wonderfully for cookies! LISA QUESTIONFeedback: I wonder why my cookies cracked after it bakes. ROSE REPLY cookies will crack after baking or just towards the end of baking if they are over-baked. since they are so small they continue to bake on the sheet even after removal from the oven. try baking them less. if that doesn't help, use superfine sugar, or grind fine granulated sugar in the food processor. the finer the sugar the smoother the cookie. DEBBIE QUESTION: I often see cookie or cake recipes that I'd like to try, but they contain varying amounts of coconut, which I detest. What is the maximum amount of coconut that I can omit, and still have the recipe come out right? Or is there something I can substitute? ROSE REPLY coconut is a very assertive flavor so there are those who adore it and those who detest it. if there are a lot of ingredients in say a cookie recipe and not a large amount of coconut it would surely make no difference if you left it out but if coconut seems to be the main or dominant ingredient the best thing is to chose another cookie or cake--there are so very many to chose from it shouldn't be a problem. KAREN QUESTION I can not bake cookies. All of my baked cookies go flat. I have cookies look great fresh out of the oven and then go flat in minutes and I have had cookies go flat in the oven. I have an oven thermometer, I have tried hand mixing and have tried margarine versus butter to no avail. ROSE REPLY use a lower protein flour such as bleached all-purpose flour. unbleached has higher protein which ties up the liquid keeping it from turing to steam and puffing up the cookie. also, after shaping the cookies, refrigerate them for at least 30 minutes or freeze them for 10 minutes if you have freezer space. that way they can set in the hot oven before they start to spread. if this doesn't help enough, try increasing the oven heat by 25 degrees. BEVERLY QUESTION Each year I try to bake a pinwheel cookie.What is a good way to slice it? My recipe says to slice it one fourth of an inch.How can this be done.My slices are always too thick&when I try to make them thinner that is when I always mess it up.Can you help me? ROSE REPLY you need to chill the dough until very firm before slicing. you can even freeze it until firm enough to cut even slices. i like to use a serrated knife. ROSE REPLY cookies usually become dry due to overbaking as they continue baking after removal from the oven. better to underbake as you can always return them to the oven but you can't UNbake! bake the cookies until starting to brown at the edges and set but still soft when pressed in the center. leave them on the cookie sheets just until they are firm enough to remove and then transfer them to racks. a few spoonfulls of molasses, honey, or corn syrup will also help to keep cookies soft. Jane Question: Wnen using parchment paper for cookies, do I grease the paper if the recipe says to grease pan, and must I change the paper each time that I bake another batch of the same cookie? Rose Reply: no need to grease the parchment but it is a good idea to change it between batches as it will start to turn brown and fall apart. also residue or tiny bits of the cookie dough will start to burn and get into the new batch. Rose Reply: yes—melting moments are supposed to melt in your mouth not on your cookie sheets! you say the cookie sheets are NOW professional grade so maybe that’s the reason. heavier cookie sheets bake more evenly but will probably take a little longer to heat up which means the dough can spread more before setting. it would help to set the shaped cookie on parchment on a baking sheet with one open side and then slide it off onto a room temperature or heated baking sheet before placing it right in the oven. this technique helps all difficult cookies to keep their shape especially useful when doing cut out christmas cookies. a good thing for everyone to keep in mind is that when things that worked for years suddenly stop, it helps to think really hard what thing or things have changed. even something small may be the culprit. sometimes the flour has a different protein content which will also have an effect on baked goods but in your case i don’t think that’s it. and don’t trust professional calibration 100%. if the things you’re used to baking suddenly take more or less time you know the oven’s off! Henna Question: Hi Rose, I'm working in a new bagel shop/bakery and i am in charge of the bakery department. i'm looking to introduce some new items based on recipes that i use at home. at the bakery we measure everything in pounds, ounces and quarts. how can i charge my cookie recipe that makes 24 cookies to a recipe that makes 400 cookies??? i'm stumped and i've been looking for the answer but i can't find any clue anywhere? can you help me or can you point me in the right direction? thanks! Rose Reply: i do everything in weights even for 6 cookies because it’s so much faster and easier. all you have to do is convert your smaller recipe to weights. make a batch weighing each ingredient and then multiply it. the problem you may run into is that things mix differently in larger quantities. you may have to adjust mixing time.